Recently Alex and I have been watching more (relatively old) Good Eats recently, and one of the episodes recently extolled the virtues of classic cocktails. Since Alton Brown insisted on gin in his martinis, we decided to revisit the spirit. I enjoyed an occasional gin and tonic in the past but at some point stopped liking them much; Alex believed he didn’t like gin. So, we decided to try a few gin drinks with some pretty good gin (we tried Beefeater) and see how we like them. First we tried the Gin Martini that Alton Brown makes. His is simple. I was making it from memory, so I forgot that he stirs his martinis and thus shook mine instead. How to make: add ice to your shaker, and add 1 ounce of dry vermouth. Stir, and discard vermouth (keeping ice). Add 2.5 ounces gin. Stir, then pour into chilled martini glass. I don’t like waste, and thus I thought about keeping the vermouth for the second martini; when I measured it, however, it had gained one half ounce of water. Definitely reason to pitch it. As an alternative to Alton Brown’s minimalist martini, I decided to make the recipe that was on the back of the bottle of dry vermouth. Add ice to your shaker, and add 1 part vermouth to 2 parts gin (or vodka). Shake and pour into martini glass. Garnish with lemon peel (which I did not). The good things about both of these cocktails: they’re simple to make, and they’re neither sweet nor heavy. You only need gin and vermouth to make them. I often find I’m limited to beer if I don’t want a sweet drink (and I consider anything made with soft drinks sweet), and I generally prefer darker beers. Martinis are not filling, not heavy and dark like beer can taste, and not sweet. What I didn’t like about them: you’re really just drinking gin. This is especially true with Alton Brown’s martini. With the 2:1 gin-vermouth martini, you get much more vermouth flavor. It is more drinkable than Alton Brown’s; you can take bigger sips, but you get tired of it sooner. My verdict? You really have to like love gin to drink martinis. Or olives, if you make dirty martinis. I don’t like olives. Since we had the gin, though, I decided we should try other drinks. 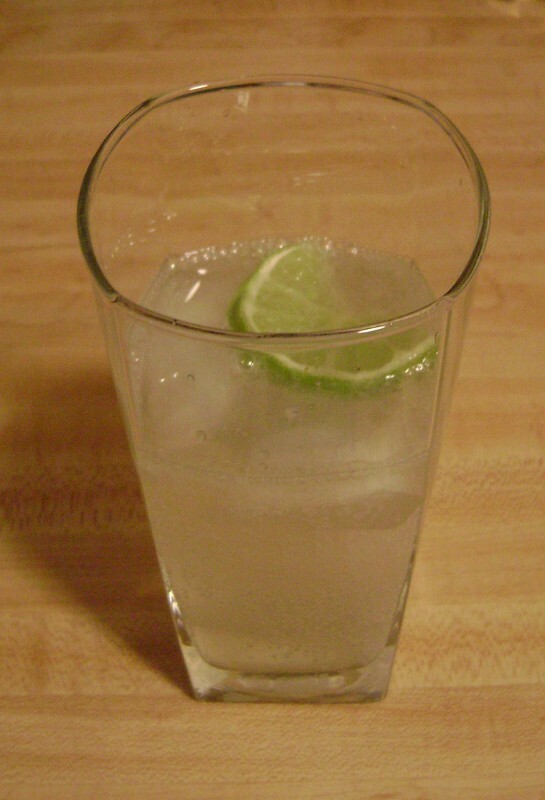 I had come across a Gin Rickey recipe the other day. They’re basically gin and tonics with club soda or seltzer water instead of tonic water. I knew Alex didn’t like tonic, and I think that’s what I’d come to dislike as well. This recipe is likewise simple. Put ice in a shaker, and add 3 ounces gin and 2 tablespoons lime juice (a ratio of 3:1). Shake, then pour into 2 tall glasses with ice. Top with club soda (3-4 ounces per glass, no more than a half cup); squeeze a lime wedge over the top and add to the glass for extra lime flavor. The recipe is from Epicurious, but Alton Brown had insisted on using real limes in cocktails, so that’s what I went for. Alex thought this was okay – it wasn’t his favorite thing – but I really enjoyed it. It was herbal and refreshing. You need to like lime to like this drink, since it’s simply flavored, but I would guess you could try lemon with it instead. This was flavorful without added sugar or sweetener. It was a drinkable, balanced drink; nothing was overwhelming. I will definitely make this again, particularly on a warm summer evening when you really want something refreshing.